Type Locality Kilewa Bay, Lake Tanganyika, Zaire. Coloration in Alcohol- Body lacking spots; uniformly brown, all barbels brown; dorsal and pectoral-fin spines brown, filaments dark. All rayed fins uniformly brownish with black patches at base of rayed fins. Large axillary pore present; up to 22 mandibular teeth; 8 pectoral fin rays; premaxillary toothpad uninterrupted; maxillary barbel with narrow basel membrane; secondary branches on medial mandibular barbel present; granular papillae present on skin of body. Humeral process narrow, elongated, granulous; possessing distinct ridge on ventral margin; dorsal margin concave; terminating in a blunted point. General Remarks An explanation is in order as to why there is some confusion with what has been called Synodontis dhonti in the past. 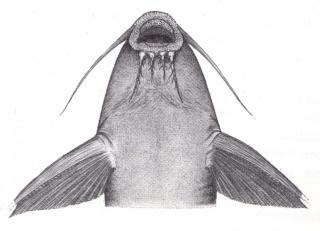 Synodontis dhonti (Boulenger 1917) was described from a single specimen collected in 1912. 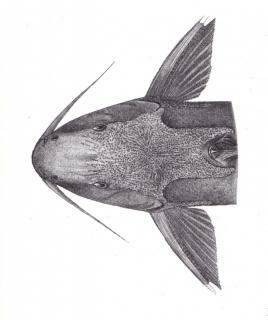 Synodontis irsacae (Matthes, 1959) was placed in junior synonymy with S. dhonti by Matthes in 1962 with specimens of S. irsacae being thought to be juvenile individuals of S. dhonti. Wright & Page in 2006 put forth that none of these specimens have carried on any ontogenetic changes that would support the idea of S. irsacae being a juvenile form of S. dhonti. A major difference between S. dhonti and S. irsacae also being the absence of an axillary pore in S. irsacae. 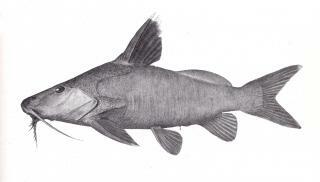 Mathes cited a specimen in 1962 as being intermediate between the two species and this fish turned out to actually be a specimen of S. tanganaicae. Synodontis dhonti is a very large brown Synodontis based on its description. The fish many have kept for years as S. dhonti have neither grown very large or very brown, which suggests they are not what was once thought. References Ann. Mag. Nat. Hist. (Ser. 8)v. 20 (no. 119) - pp367. Wright, JJ and LM Page (2006) Taxonomic revision of Lake Taganyikan Synodontis (Siluriformes: Mochokidae). Florida Mus. Nat. Hist. Bull. 46(4):99-154.